Any way you slice it, July is peak season. It’s the ideal month to hold company and corporate cookouts, picnics, and parties. After all, it won’t be too many more months before we’re all cooped up inside again—so it’s time to take advantage of all the options Mother Nature gives us right now. 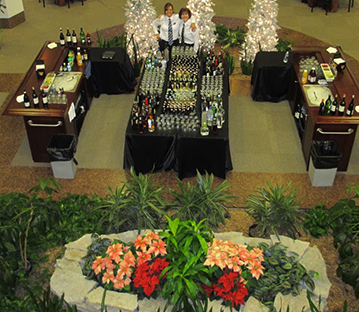 Want to help your next company or corporate party stand out? We’re happy to share ideas. Avoid hosting a ‘turkey’ of an event. Use Catering With Elegance. Whether you’re planning a day of professional development, launching a new product or company identity, or looking to celebrate your employees, bringing the team together lets everyone connect. Give food a starring role, as all of that connecting will work up appetites. A charity golf outing, running or walking race, or other fundraiser is a great way to engage your employees and customers. Make sure you plan a menu that satisfies your guests and incorporates some of the flavors of the season. Bringing in entertainment delights guests. Consider hosting a concert or performing arts event or other local, cultural entertainment for your annual meeting, board meeting, retirement reception or other big event. Amp up the wow factor with a pig roast, or choose from our Italian or Mexican Catering options. Ropes course? Walking tour of the city? 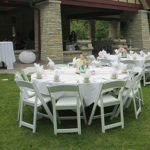 Hosting a company picnic at one of the Cook or DuPage County Forest Preserves? Make it memorable with delicious catering after the adventure is done for the day. A prepared buffet or boxed lunches ensure your guests are happily fed. From planning to serving food to your guests on-site, you’ll find our expertise ensures every detail is covered. Most of our packages start at just 15 guests, so even small party catering is within reach.